Do you wish there were more hours in the day to get things done? Are you finding it hard to fit everything you "must" do and everything you "want" to do into a day, week, or even a month? I have to tell you, you are not alone. Lately I have found myself lost in the minutia at work. To do lists and reminders aren't enough to hone it all in. By the end of the day I am pretty much done with thinking (kaput!) and I wind up home, alone, watching tv and drowning out all of the noise. The next day I wake up thinking..."Why didn't you spend last night doing something productive?" "Why didn't you do something you always complain there's no time for...a creative project...get back into yoga...blog on jl...cook a new recipe...read a good book? The list goes on and on, but I just sit and sit. So, how do you go about finding balance and making the best use of your time? This is what 2013 is going to be all about for me, and since I have a year to work at it, this post is about finding a place to start. First, let's talk about why life balance is so important and how the meaning can be different for each person. Maintaining a healthy life balance benefits your mood, well-being, productivity, and can aid in both personal and career success. By identifying what achievements in life (family, career, social life, fitness, etc.) are most important to you, and focusing on how you can improve each, you can make changes (even small ones) that are very meaningful in that pursuit. Maybe you are doing a few things really well, but other areas need more attention? Maybe there are some things you need to let go of or learn to say "NO!" to in order to give others more room to grow? However the path to life balance may look, the trick will be finding fulfillment without feeling overwhelmed or out of control. The good news is...once you feel balanced, you will know how to keep it and maybe even fight for it. You'll know immediately when things feel a "little off" and make small changes to get back on track. So...here I am...feeling off balance. Fully admitting that I am not paying enough attention to areas of my life that overall benefit me greatly. While I could throw myself full force into everything I feel I am lacking (tried that! ), this approach usually leads to more and more stress. Trying to improve everything all at once is overwhelming. Instead, taking stock and seeing the bigger picture will help me to approach things gradually. (Baby steps!) This is where the "Life Wheel" comes into play. 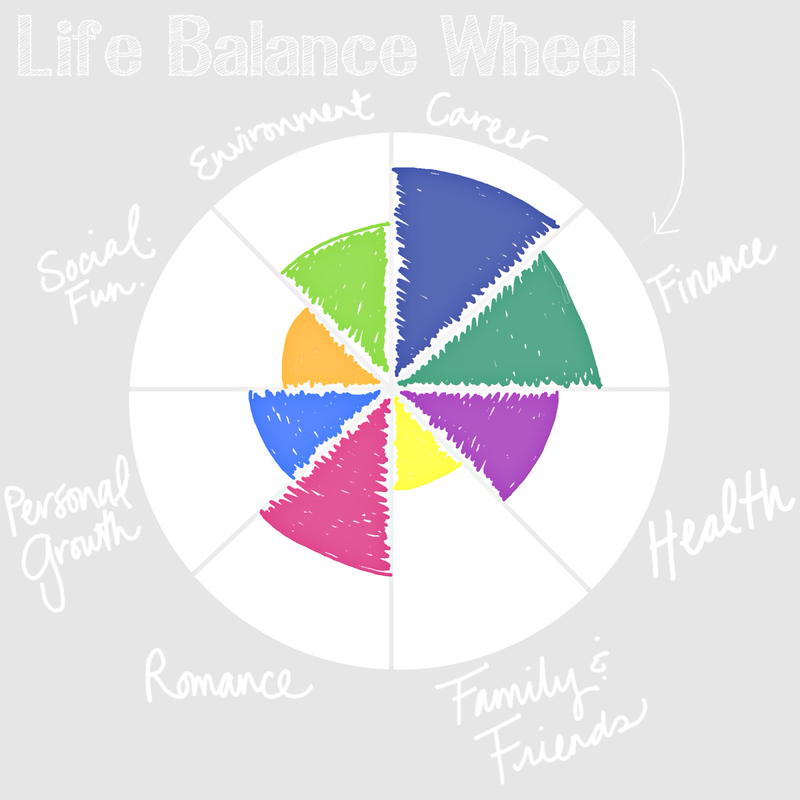 The Life Wheel is a tool often used by professional life coaches to help clients determine 6-8 aspects of life they find most important and then assess how fulfilled they feel in each. This exercise not only allows you to see which areas may need improvement, but it helps to identify and enforce areas of success! A few nights ago I completed my Life Wheel. My 8 important areas included Career, Finance, Health, Family & Friends, Romance, Personal Growth, Social/Fun, and my Environment. After filling in my satisfaction with each, here is what I found. Now, imagine the edges of the wheel are defined by the edge of each shaded area. How bumpy would that ride be? I have a feeling that at some point, this wheel would just stop turning. And THAT, my friends, is a clear sign of imbalance. Using my current life wheel as the "big picture", I can decide what steps to take next to balance this sucker out. The goal is not to fill each one, but to align the segments with my ideal level of satisfaction. For me, the wheel should be closer to "round" but a perfect circle is not required. For example, I would like family & friends, social/fun and health to be more fulfilled, and I may need to reduce the career segment to achieve that. Depending on your needs, each slice may not be filled up to the very edge and you may even reduce an area or two. Whatever the approach, "rounding out" the wheel will signify improvements in your life balance. That is my goal for 2013. More...even...slices. Over the next 10 months I will work towards achieving balance and periodically renew my Life Wheel to track improvements, goal achievement, and possibly even setbacks. Would you like to fill out your own Life Wheel? If you like my 6-8 life areas, here is a template to get you started. Otherwise, instructions for starting one from scratch can be found after the jump. Now...I'm off to make some changes. Until next time! 1. Grab 2 sheets of paper. One is for brainstorming you 6-8 life areas that are most important to you, the other is for drawing your Life Wheel. Use whatever artistic tools that inspire you...colored pencils, sharpies, magazine clippings, a drawing app...it's up to you! 3. Draw the outline of the Life Wheel, divide into 6-8 slices, and label each "slice" with one of your 6-8 items. 4. Consider the amount of satisfaction or devotion you have for each area on a scale of 0 to 10; 10 being the outer edge of the wheel and indicating the highest level of fulfillment. Fill in each slice accordingly. Be honest and keep in mind that different areas of your life will receive different levels of attention at different times. If one or two areas are lower than the rest, the wheel will still turn smoothly enough. 5. Now review the shape of your Life Wheel. If it were a real wheel, how bumpy would the ride be? 6. Determine ways to make the ride smoother. What goals do you have for each area? Reduce attention? Focus more? Plot your "ideal" level of satisfaction for each and brainstorm ways to achieve those goals. Remember that you can reduce areas that may be pulling more energy than you would like. Could that time make a bigger impact elsewhere? One example would be shaving 15 minutes off your work day to make time for exercise. Shifting a small amount of attention from the Career slice could make a world of difference in your Health slice. 7. Write down your plans for shifting focus and achieving your goals. Then, a few weeks or a month later reevaluate by filling in a new Life Wheel. How do they compare? What progress have you made? Repeat this process periodically until you have found a balance that works for you. Remember, the segments don't have to be even. The goal of this exercise is not to obtain a perfect circle, but to find your own definition of a balanced life.